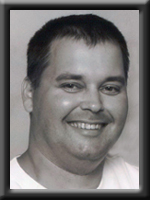 SCOTT – Arthur , 40, of White Point, Queens County, passed away suddenly in Queens General Hospital, Liverpool on Tuesday, July 9th, 2013. Born in Liverpool he was a son of Arthur (June) Scott of Sable River and the late Hilda (Skinner) Scott. His father introduced him to the water right after high school. He advanced from deckhand to mate then onto 4th class engineer. He worked for Clearwater, Mersey Seafoods and then OCI International (NL). Family meant everything to him especially his children, Kaitlin and Carter. He enjoyed simple things in life; playing darts, volleyball, golf and baseball. He enjoyed model vessels, watching hockey and playing X-box with his children. He is survived by his daughter Kaitlin, his son Carter, both of Hunt’s Point, his sisters Claudine (Robert) Martin of Lower Branch, Tammy (Tim) Delaney of Mersey Point, Bonnetta (Bernie) Allison of Port Mouton, Claudette Scott of Liverpool as well as many aunts, uncles, nieces and nephews. We were sorry to hear of the loss of your son, brother, father, uncle and so it is with deep hearfelt sympathy that we send you our deepest condolences. RIP Arthur. Our sincerest sympathy with you at this most tragic time. Art, Bonnetta, Claudine, Claudette, Tammy, Kaitlin and Carter…my sincere sympathy and condolences to all of you and Bubby’s extended family. Lean on each other for support to help you through this most difficult time. RIP Bubby…. Please accept our thoughts of sympathy at this sad time. Bub is gone too young, but hopefully you will take comfort in your memories of the happy tiimes. He has two wonderful children to remember him by. We will be thinking of your whole family in the days to come. To the Scott family -so sorry for your loss. Just wanted to let you all know that you are in my thoughts at this difficult time.Hold on to the good memories and with family and friends you will get through. Scot and family, I cannot begin to understand how such a sad loss must feel. Our Childern are our world,we should not lose one so young. My heart goes out to you and your family. May god keep you strong, God bless. So sorry to hear of Bubbys passing. My thoughts and prayers are with you and all the family at this difficult time. On behalf of Kiwanis Club of Liverpool and myself we send you condolences to you and your family. We are thinking of you at this difficult time. Just remember the good times with your Dad. art,claudine and the rest of the scott family,it was a shock to hear about arthur jr. he was avery good dart player when he played darts at the legion with his father and his mother. he didn’t cause any trouble to anyone he was a nice guy. rest in peace bubby. Kaitlin, Carter and family, so sorry for your loss. To the scott family (extended family) my sincere sympathys on the passing of Arthur. may he rest in peace. My thoughts and prayers go out to all of you. So sorry for your loss of a son, brother and father, he passed way too young. Please accept of very deepest sympathy to you all. so sorry to hear of your loss. our thoughts and prayers are with you all. Kaitlin, Carter and the Scott family.We are so very sorry for your loss. Our deepest sympathy to you all.R.I.P. Arthur. To the extended Scott family,We are sending our condolences and our heartfelt sympathy to all of you. Bubby is with the angels and at peace, and I hope this knowledge helps to ease your pain a little.With deep sympathy, Gordon and Merle Fisher. We are so sorry to hear of the loss of little Arthur, as we always called him, when we were neighbors. He always was willing to lend a hand when we needed him. He was such a good ball player too. He so missed his Mom after her passing. Now he will keep her company and watch over all of you. Rest in peace young man, you will always be remember in our hearts. Please except our deepest sympathy Kaitlin, Carter and all the rest of the Scott family. To Arthur’s Family- May you take comfort in knowing how much others care. Cherish the memories and remember Arthur with a smile. Please accept my condolences and know that you will be in my thoughts and prayers. So sorry to hear of the lost of your loved one. You are in our thoughts and prayers. Remember the good times and take comfort in knowing he is in the arms of his Mom. Kaitlin, I am so sorry to hear of your loss. My thoughts and deepest condolences are with you and your family. So sorry to hear about your brother. I know you were very close. May your memories help you cope! Hang in there! Take care! Was sorry to hear your sad news. Our thoughts are with you at this sad time. So sorry for your family’s loss. Our thoughts are with you. I did not know Arthur but wanted to express my sincere condolences on your loss. losing one so young is especially unfair and tragic, perhaps in time this promise will bring a measure of comfort. I was sorry to hear of your tragic loss. My deepest sympathies are with you at this difficult time. Our sincere sympathy to all of you,You will be in our thoughts and prayers at this very sad time. What a tragic loss for you all. Taken too soon. Praying for you all especially the children for strength and courage to move forward with out him. Remember the good times. He had such a wonderful smile. He loved his family very much. Sending our deepest sympathies. Our sincere condolences to Arthur’s family. Such a sad time for all. Thinking of you all during this difficult time. Kaitlin and Carter… Loosing a parent is very hard especially when your young. I lost my dad at a young age too. Stay strong for Dad. He would want it that way. Look to you family for support. Your family will help you get through this.. sending lots of love from us in Yarmouth. I’m so sorry and shocked to hear of bubby’s passing. It’s been a long time since I last seen bub. He will be missed. Sincerest condolences to the Scott family. Our thoughts are with you. Art & family . Our condolences go out to you all .Stay strong & keep in mind, all the beautiful memoreys . Art, Bonnetta and the whole family. I was so very shocked to read of Bubby’s passing. Although I didn’t know him well, I remember him fondly from playing darts in Port Mouton. Please accept my sincere condolences. So sorry for your loss Carter & Kaitlyn. Try to remember the good times you had with your Dad and know that you have lots of family and friends to help you through this. Hugs & Kisses from the Wolfe Family. Art, Tammy, Claudette, Bonitta and Claudine – We are so very sorry for your loss. I have many fond memories of Bubby. You are all in our thoughts. We have just arrived home and heard the news and was totally shocked.We have always found Arthur very kind and friendly and send our regrets to all of his family as we know this is a very difficult time. Our thoughts & prayers are with you in this time of great sadness. have good memories of what a wonderful son and brother he was. Our thoughts and prayers are with you and may god bless. Please except our great saddeness for the loss of Bubby. Your father was just down home the other day and was talking about the old times and fun we used to have . Our prayers and thoughts are always with you.He`s in a better place now at peace with his mother.Remember the good tmes we had with him. was. Our thoughts and prayers are with you and may god bless. Dear June, Arthur and family: There are no words to lessen the pain you are all experiencing. Take strength from each other and remember the love you all shared with Arthur Jr. He was a wonderful son and father who loved you all. Love not time will heal your hearts. Our prayers and thoughts are with you all. We are sorry to hear of your loss. I will inform Jenny & Jason. May you have many happy memories of Arthur. We are so saddened by Bubby’s passing . Our prayers are with you during this difficult time of great loss. Thinking of you all and wishing you peace in your memories. Sending our sincere condolences to Arthur and family. Sincerest condolences to the Scott family. I did not know Arthur but was just reading the paper and noticed his obituary and wanted ot leave a few words for the family. I hope that this bible text gives you some comfort now and a hope for the future, take care. our prayers and thoughts are with you and your family. so sorry to hear of your loss. may your memories help you overcome the sadness. I am so sorry to hear of Arthur’s passing. I met Arthur in High School …. we were in the same class. A very sweet guy! We had lots of fun at school dances. Although I haven’t seen Arthur in a long time, I will miss him…. as well as many others. Thinking of you all at this very sad time. Sending our heartfelt condolences to the family. our prayers and thoughts are with the family at this most difficult time…cherish your memories, as will the rest of us who had the pleasure of sailing with him. the loss of Bubby.You are all in our thoughts and prayers.